Technology is evolving rapidly, customer expectations are changing and we’re facing a more competitive global market. To ensure we thrive in these conditions, we’re embracing diversity and investing in programs to attract and retain employees with the skills and passion to help transform Telstra into a world class technology company. This year in our employee engagement survey (EES) we shifted our key metric to sustainable engagement, a more rigorous measure that provides a deeper understanding of the key drivers of performance – how engaged, enabled and energised our people are in their roles. We achieved a sustainable engagement score of 71 per cent with an 80 per cent response rate. This score is close to our global peers, with the global high technology companies’ norm being 73 per cent, but well short of the global high performing companies’ norm of 80 per cent that we aspire to. Over the coming months we will develop action plans to help us to improve employee advocacy and further empower our people to create brilliant customer experiences by reducing complexity and improving customer processes. The survey also showed that our employees remain proud of Telstra’s purpose, integrity, diversity and social and environmental performance. We are making good progress in our efforts to continuously improve the Health, Safety and Environment (HSE) culture. This year we reviewed our enterprise-wide HSE Management System and introduced a set of 10 Global HSE Standards. These are organisation-wide standards that the business strives to achieve and our performance is measured against. They are supported by minimum HSE requirements for our critical and key HSE risks as well as procedures and guidelines to support effective implementation. Our proactive, risk based approach to health and safety management is helping to prevent incidents from occurring. 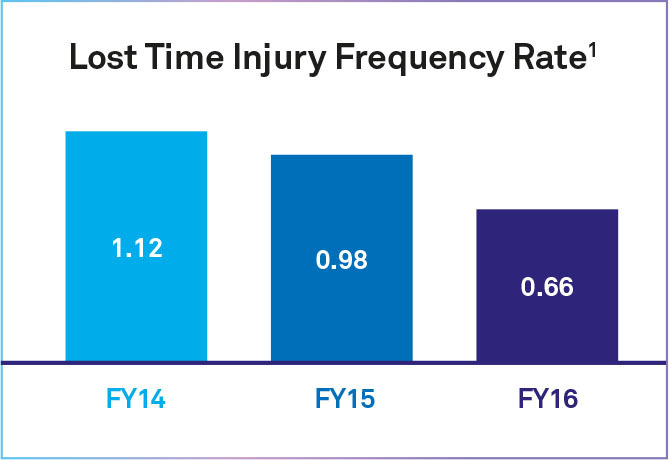 Throughout FY16 our injury rates continued to improve. Our risk reduction programs and enhancements to injury management and claims management delivered positive results. Our employee Lost Time Injury Frequency Rate (LTIFR) reduced by 33 per cent this year. The health and safety of our people is paramount to us and we have robust risk management programs and standards in place. However, in February this year a contractor tragically died after he fell from a mobile telecommunications tower in the Northern Territory. We responded by reinforcing Telstra’s requirements for employees and contractors when working at height and conducted an audit of all relevant work at height activities across Australia to provide reassurance our standards were being followed. We also provided ongoing support to affected employees and contractors, as well as their families. Telstra has fully co-operated with Comcare during its investigation of this incident. 1. LTIFR is the reported number of accepted workers’ compensation claims for work-related injury or disease that incur lost time for each million hours worked. Includes Telstra Corporation Ltd employees only, not including subsidiaries or contractors. We value diversity and inclusion and the benefits they bring to the Telstra Group in achieving our objectives, enhancing our reputation, and attracting, engaging and retaining talented people. At Telstra, diversity means difference, in all its forms, both visible and not visible, and includes differences that relate to gender, age, cultural background, disability, religion and sexual orientation, as well as differences in background and life experience, and interpersonal and problem solving skills. We are committed to gender equality and have a broad range of policies, programs and engagement initiatives in place to help us achieve this goal. Gender representation targets are in place across all business units, supported by expectations of gender-balanced shortlists for recruitment and gender-balanced selection panels. We encourage our people to get involved by joining our Brilliant Connected Women network – a forum that now has over 2,000 members, male and female, who are committed to advancing gender equality in our business. This year we saw a decrease in female representation across Telstra Corporation Limited and its wholly owned subsidiaries of 0.4 per cent. This decrease reflects a reversal of a consistent company-wide trend of previous years that saw female commencements exceeding female exits. Gender pay equity continues to be a key area of focus and we remain vigilant about how we administer and apply policy to avoid any bias in performance assessment and remuneration decisions. To work towards gender pay equity, we examine our remuneration data across all business units every year to identify any pay disparities that can’t be explained by differences in length of service, or levels of performance or role type. Each business unit has a dedicated budget for correcting disparities and we closely monitor the application of this budget to ensure funds are distributed in line with the core principles. Includes full time, part time and casual staff in Telstra Corporation Limited and its wholly owned subsidiaries, excluding contractors and agency staff. It does not include staff in any other controlled entities within the Telstra Group. Includes full time, part time and casual staff in controlled entities within the Telstra Group, excluding contractors and agency staff. Information regarding the controlled entities in the Telstra Group can be found on our website at telstra.com/investor (Latest Results). Flexibility is the starting point for all roles at Telstra. This year we rolled out the second phase of All Roles Flex, focusing on global mobility and location flexibility. We want our people to bring their whole selves to work and to feel comfortable doing so. This year we celebrated the seventh anniversary of our Spectrum network for LGBTI employees and allies. We also launched guidelines to help our people to understand how they can provide support for colleagues going through a gender transition. Earlier this year there was commentary regarding Telstra’s position on marriage equality. While we initially advised that we would not actively participate in the marriage equality debate, out of respect for the wide range of views on the subject, it became clear to us that Telstra should step forward on this topic. We have renewed our active participation on marriage equality and are in discussions with Australians for Equality about what role Telstra might play in support of their campaign. We are committed to providing employment pathways for candidates with diverse backgrounds and needs. This year 182 Telstra employees identified as being of Indigenous descent through our EES. Key initiatives included providing mentoring alongside traineeship and internship opportunities to support retention and career development. In this year’s EES, 2,546 Telstra employees identified as living with a disability. This year we were the largest corporate provider of the Australian Network on Disability Stepping Into internship program, which provides a paid internship program to university students with disability. In Australia, people aged 45 and over make up the fastest-growing employee category. We have developed a return to work program for older people who have been out of the workforce for an extended period of time, which will be rolled out across Telstra in FY17. More information on Diversity and Inclusion at Telstra, including our Diversity Measurable Objectives, can be found in our 2016 Corporate Governance Statement which is available on our website at telstra.com/governance. As our business changes, it’s important that our culture, values and behaviours are consistent and that we have the necessary knowledge and skills to manage change and complexity. In FY16 we invested $45 million (not including labour costs) across the Telstra Group in learning and development opportunities. This supported the rollout of a suite of Telstra Leader programs for aspiring, new, experienced and executive leaders and our Core Capabilities development programs which enable our people to further develop key business skills. Our Business Essentials training program helps ensure our people are aware of their legal, regulatory and compliance responsibilities. Mandatory refresher training is completed annually, with each compliance topic covered every two years at a minimum. As at 30 June 2016, 97.7 per cent of Telstra Group employees and contractors had completed this year’s mandatory refresher course. We encourage our people to get involved in the community. Our people contributed 8,186 days volunteering their time and expertise to a range of community organisations. Our dollar for dollar matched payroll giving resulted in a total contribution of more than $1.5 million in donations to over 350 charities.